As of 2016, it is estimated that there are now 11.3 million women-owned businesses in the United States, employing nearly 9 million people and generating over $1.6 trillion in revenues. 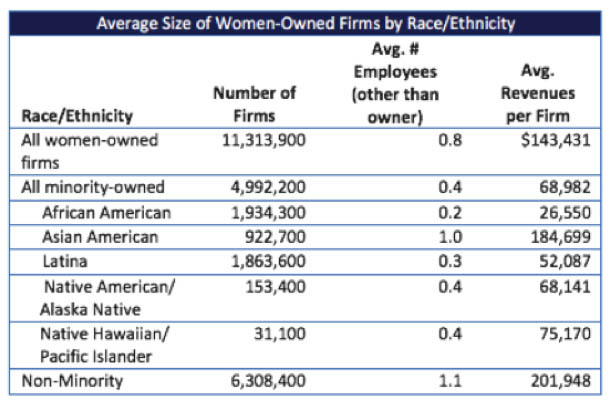 Women are now the majority owners of 38% of the country’s businesses, up from 29% in 2007. These firms employ 8% of the nation’s private sector workforce – up from 6% nine years ago – and contribute 4% of the nation’s business revenues, a share that has not changed over the past 20 years. Overall, women-owned businesses generate $1.6 trillion in annual revenue. By employing 9 million American workers, female entrepreneurs are shaping the future of the American economy. To promote supplier diversity, the Small Business Administration (SBA), in 2011, created the Women-Owned Small Business (WOSB) Contract Program. To be eligible, the business must be 51-percent owned by women of U.S. citizenship. It must also meet SBA size standards within its industry. Business revenues among women-owned firms have increased by 35% since 2007, compared to 27% among all U.S. firms – thus at a rate that is 30% higher than the national average. The federal government has a goal of awarding 23 percent of its contracts to small businesses. Furthermore, it sets a goal of giving at least 5 percent of prime and subcontract dollars to WOSBs. Competing for federal government contracts provides exciting opportunities for growth to businesses with WOSB certification. However, the federal government has yet to meet its WOSB contract goals. According to a study from American Express OPEN, the average small business owner, male or female, waits an average of two years and makes at least four bids before securing a government contract. Denise Barreto, owner of a strategic planning firm called Relationships Matter Now, bid on eight contracts before being rewarded on her ninth try. According to Barreto, the biggest obstacle to WOSBs is they don’t know enough about how to win government contracts. The government, according to Barreto, needs to improve its outreach. Overall, women-owned businesses generate $1.6 trillion in annual revenue. By employing 9 million American workers, female entrepreneurs are shaping the future of the American economy. In certain industries in which women business owners are underrepresented, government agencies set aside contracts exclusively for women-owned businesses. Set-aside contracts for services performed can award projects costing up to $3 million; for manufacturing, they can go as high as $5 million. In many cases, third-party certifiers can help with WOSB certification, help them identify opportunities and explain the bidding processes. They can also help women determine if they meet income and wealth guidelines for the EDWOSB program. In addition, they can assist with other supplier diversity programs, including MBE certification. Winning a federal contract can significantly boost business growth and provide opportunities for doing additional business with other government agencies. Rafael Marrero & Company, a certified Minority-Owned Business (MBE), helps female business owners identify and position themselves for contract opportunities. In addition to helping them win contracts, Rafael Marrero & Company helps female business owners develop growth plans and increase capacity. Call 1-888-595-6221 for a free consultation, or email rafael@rafaelmarrero.com. Today’s call will unlock tomorrow’s business growth. Rafael Marrero & Company is a Better Business Bureau (BBB) Accredited Business with an A+ business rating.